This is the largest of the Windy Hill Collection Santas. He stands at a full 3 feet tall, 19 inches wide, and 13 inches depth, this Santa truly makes a huge holiday presence. He is wearing a deep red robe with multiple layers of gold trim and cream colored front lapels. His dark green vest is decorated with red and gold polka dots, and a truly festive gold ball tassel trim. He is carrying a grand gold staff adorned with multiple gold and red ribbons, plus pine and cranberry garland. His huge stuffed toy bag is filled with a delightful white teddy bear holding a red and gold ornament, miniature rocking horse, nutcracker toy soldier, wrapped gifts, and pine garland. His silky smooth beard and mustache complement his rimless glasses with that Christmas twinkle in his eye. And did we mention the bells? He has bells on his toy bag, bells on his gold staff, and bells on his lapels! 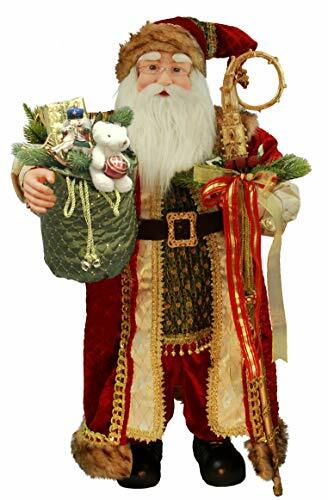 This 36" inch grand Santa will jingle jangle and ring holiday spirit wherever he goes.